Miami - (March 02, 2010 ) - To witness the next solar eclipse, you have to wait until July 11, 2010. 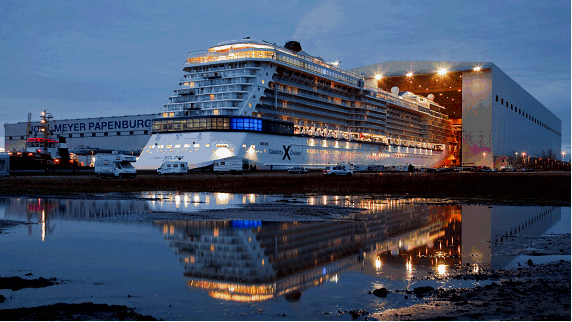 But if you're in the area of Papenburg, Germany, you can see Celebrity Eclipse right now. The third in Celebrity Cruises' stylish, $3.7-billion Solstice Class fleet, Celebrity Eclipse showed off her sleek profile Sunday as she emerged for the first time from the Meyer Werft shipyard in Papenburg, Germany. Celebrity Eclipse will enter service April 26 and, following two "short break" cruises, will offer a series of Canary Islands, Scandinavia/Russia and Spanish Mediterranean sailings roundtrip from Southampton, England. The new vessel will present Caribbean cruises roundtrip from Miami beginning in November. Celebrity Cruises is designed for discerning cruisers, with modern, sophisticated environments, impeccable service, enriching and inspiring onboard programs, and world-class cuisine. The ultimate in premium cruising, Celebrity sails in Alaska, California, Canada/New England, Europe, the Pacific Coast, Panama Canal, South America, and year-round in the Caribbean and the Galapagos Islands. Celebrity also offers immersive cruisetour experiences in Alaska, Canada, Europe and South America. Celebrity's mega-series of honors include being named the top mega-ship line in Condé Nast Traveler's annual Readers' Choice Awards (November 2009). Celebrity's fleet currently consists of nine ships. Its $3.7-billion investment in building five stylish Solstice Class ships between 2008-2012 represents the largest five-year investment in premium cruising. For more information, call your travel agent, dial 1-800-437-3111.